In a Nutshell: With so many credit card rewards programs to choose from, it can be hard to narrow down the options. When it comes to hotel rewards, though, there is no real competition — the greatest rewards cards are all now part of Marriott International. With the recent acquisition of the Starwood Hotels & Resorts, the Marriott International family has grown to include more than 5,700 total properties across the globe. The merger brought on a host of new benefits for loyalty customers, including account-linking and point transfers across brands. Now, their latest union allows holders of any of their rewards cards to earn points across all Marriott Rewards, Starwood Preferred Guest, and Ritz-Carlton brands. 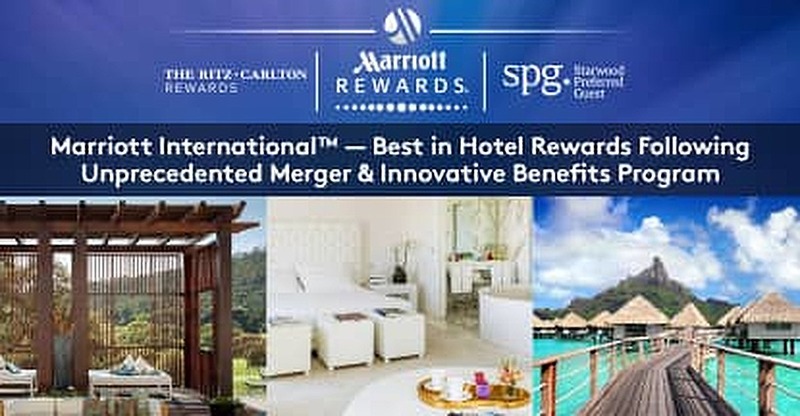 Marriott International’s smooth and speedy merger has helped three already amazing rewards programs easily skyrocket to the head of the market, giving them our vote for the Best Hotel Rewards Programs. Other than purchase security, credit card rewards are, in my opinion, the best reason to have a credit card. It’s essentially like walking around with a discount coupon on everything, and whether you prefer to earn cash back, air miles, or free hotel stays, there’s a rewards program for you. Unfortunately, the niche nature of some rewards can be both a blessing and a curse. You have to pick the places you want the best rewards from and those options can get pretty narrow, which can make redeeming your rewards for the things you actually want quite difficult. You may have racked up thousands of airline miles, but if the airline you’re loyal to doesn’t fly to your destination of choice — neither do you. The best way to ensure you can always use your rewards where and when you want is to find the program that offers you the most choices, both for earning and redeeming your rewards. When it comes to hotel rewards, the best programs by far are offered by Marriott International, whose recent acquisition of Starwood Hotels & Resorts has given them the most diverse selection of hotels in the marketplace. “The marriage of these two leading hotel companies means Marriott will deliver an unparalleled guest experience with more hotels in more global destinations, an unrivaled range of comprehensive accommodations to suit every traveler, and the industry’s best loyalty programs,” said Arne Sorenson, President and Chief Executive Officer of Marriott International. That’s no empty boast. Marriott International now includes the familiar Marriott brand hotels, as well as Starwood’s premium Sheraton properties and the iconic Ritz-Carlton luxury hotels, among dozens of other popular lifestyle brands, for a total of an impressive 5,700 properties, across 30 brands, in more than 110 countries around the world. Customers of all of the properties now owned by Marriott saw a wide array of new perks as soon as the merger was finalized. Now, just a few weeks later, they’ll become the first to experience an unprecedented level of rewards freedom as the company’s three major credit card rewards programs — Marriott Rewards®, Starwood Preferred Guest (SPG)®, and Ritz-Carlton Rewards® — allow users to earn cross-brand rewards. “We are giving loyalty Card Members more flexibility to earn points, no matter where they stay with us. By making our credit cards even more powerful and attractive for them, they’ll earn points more quickly and enjoy travel even sooner,” said Thom Kozik, Vice President of Loyalty at Marriott. Marriott International now includes over 5,700 properties in more than 110 countries. Under the new program, customers who hold any of the three co-branded credit cards can earn loyalty points for staying at any of the Marriott International properties across the globe. “Now there’s even more incentive for members to explore our immense portfolio of more than 5,700 hotels while taking advantage of unprecedented earning power,” added David Flueck, the Senior Vice President of Starwood Preferred Guest. Marriott International offers unprecedented flexibility to both credit card holders and loyalty members, including the ability to link loyalty accounts. Previously introduced benefits include the ability to link rewards accounts, as well as receive instant Elite status matching across programs, and the opportunity to transfer already-earned rewards points between portfolios. While we all tend to be a little skeptical about change, especially when it affects our finances, in this case, everybody wins. Regardless of the brand on your credit card, if you’re a member of the Marriott International family, this is nothing but good news. Not only do you get all of these new benefits, you’ll continue to see the same rewards you’ve already been using to make the most of your spending. “The rich rewards that existing Card Members already know and love just got even better as we continue to build bridges to connect our tremendous programs,” said David. To feel the full award-winning effect of the Marriott International experience, pair your new credit card points flexibility with the company’s killer branded loyalty programs. Every dollar you spend at an eligible property will net you credit card rewards and loyalty points, not to mention a host of additional benefits. Starwood’s Preferred Guest programs have their own remarkable perks, both for SPG Card holders and loyalty members, such as free in-room wifi when booking through Starwood, no foreign transaction fees, and restaurant discounts. With your SPG Credit Card, you can earn two points for every dollar spent at eligible properties — which are now the over 5,700 properties that are part of Marriott International. You can stack those with the two points per dollar you earn as an SPG loyalty member to really boost your earning rate. Factor in that Members who link their accounts will be able to transfer points at a three-to-one ratio (three Marriott Rewards points = one SPG Starpoint) between the programs, and it’s an even greater incentive. As with the Marriott Premier card, SPG Card holders will be able to earn Elite status much quicker, unlocking benefits not only at SPG properties, but Marriott Rewards properties as well with their new status-matching program. SPG Card holders will earn Elite credit for five nights and two stays each year. To many, “Ritz-Carlton” is synonymous with “luxury hotel,” and with good reason; they are. And the best way to experience the Ritz-Carlton is by pairing a Ritz-Carlton Rewards Credit Card with the Ritz-Carlton Rewards loyalty program. Your credit card will net you five points per dollar on eligible stays at any Marriott International property, two points on airline tickets, and one point on everything else you buy. In addition, you’ll be upgraded to the Ritz-Carlton Club level for up to seven nights across three stays every year, and can qualify to receive a $100 hotel credit and $300 travel credit each year. Being a member of the loyalty program will get you an additional 10 points or two miles per dollar per stay at any The Ritz-Carlton worldwide, making it even easier to earn free nights in luxury. You can also choose to earn airline miles through more than 30 qualifying airline programs. In our modern world, cash is no longer king; it’s all about the plastic credit cards — and the credit card rewards. For the best hotel rewards program, with the best options, we’re voting for Marriott International and its three amazing loyalty programs and benefits. While already great, the addition of Starwood has easily made Marriott International the company to beat. And, to hear it from them, they’re only going to get better from here.